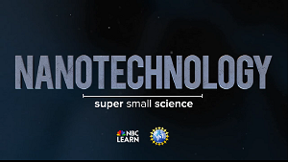 As highlighted in the White House blog today, the National Science Foundation (NSF), in partnership with NBC Learn, has launched Nanotechnology: Super Small Science, a series of videos for middle and high school students. This video series features six areas where nanotechnology has a significant impact, including advanced electronics, renewable energy, and human health. The content, which was developed for classroom use, will reach a potential audience of 9 million students across the country. Highlights will also be shared with the more than 200 NBC affiliate stations for use in news segments. The videos are also available through NSF’s Science360 website and Nano.gov. Over the past 15 years, the Federal Government has invested over $22 billion in R&D under the auspices of the National Nanotechnology Initiative (NNI) to understand and control matter at the nanoscale and develop applications that benefit society. As these nanotechnology-enabled applications become a part of everyday life, it is important for students to have a basic understanding of material behavior at the nanoscale, and some states have even incorporated nanotechnology concepts into their K-12 science standards. Furthermore, application of the novel properties that exist at the nanoscale, from gecko-inspired climbing gloves and invisibility cloaks, to water-repellent coatings on clothes or cellphones, can spark students’ excitement about science, technology, engineering, and mathematics (STEM). The “Generation Nano: Small Science, Superheroes” contest, hosted by NSF and the NNI, aims to do just that by asking high school students to design nanotechnology-enabled gear for an original superhero. Submissions (due February 2, 2016) include a brief technical description of the gear and either a video or comic showing their superhero using that gear. Three semi-finalists will win a trip to the 2016 USA Science & Engineering Festival on April 16-17, 2016, in Washington, D.C., where they will present their entries and compete for cash prizes. Nanotechnology: Super Small Science videos and the Generation Nano contest are just two examples of how the National Nanotechnology Coordination Office (NNCO) is promoting nanoscale science and engineering education across the country. Other activities include expanding teacher resources on Nano.gov and working with nanoHUB to develop a searchable database for nanoeducation; collaborating with a local school district to develop educational videos that were distributed nationwide (Innovation Workshop: Nanotechnology); providing guidance to students making animations about nanotechnology featured on Science Matters, Community Idea Stations; coordinating a growing, national Nano & Emerging Technologies Student Network; and providing outreach via presentations, workshops, participation in trade shows, and the administration of contests, including EnvisioNano and Tiny Science. Big Impacts. Cool Videos on behalf of the NNI agencies. Activities like the ones described above are critical to our future, as a highly skilled and motivated workforce with increasing knowledge of STEM will be required to ensure America’s global competitiveness. The NNI is a U.S. Government research and development (R&D) initiative involving 20 departments and independent agencies working together toward the shared vision of "a future in which the ability to understand and control matter at the nanoscale leads to a revolution in technology and industry that benefits society." The NNI brings together the expertise needed to advance this broad and complex field—creating a framework for shared goals, priorities, and strategies that helps each participating Federal agency leverage the resources of all participating agencies. With the support of the NNI, nanotechnology R&D is taking place in academic, government, and industry laboratories across the United States.